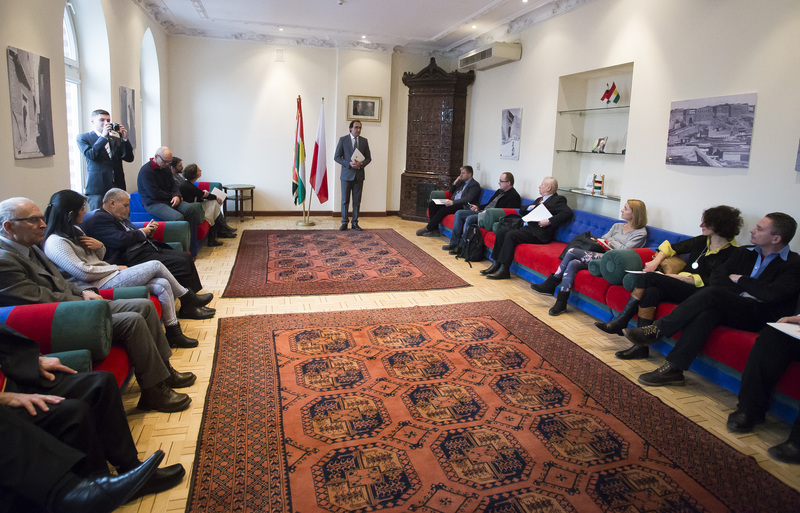 Warsaw, Poland – on January 20, 2016 as a result of Ziyad Raoof, the KRG Representative in Poland invitation, took place New Year’s meeting with journalists and media representatives. During the official part, Ziyad Raoof thanked guests for coming to the meeting and for already published articles about Kurdistan and especially about Peshmergas. He reminded how important is the media’s role in informing the societies about historical and ongoing events in the world and also in Kurdistan. In inaugural speech Ziyad Raoof talked about challenges facing the Kurdistan Region: the war with ISIS, during which more than 1300 Peshmergas were killed and 8 thousands were wounded, the humanitarian crisis as Kurdistan Region hosts 1,8 million refugees and economic crisis as the Region has been hit by a lack of budget payments from Baghdad. Ziyad Raoof briefed journalists about the referendum on independence of Kurdistan Region planned on upcoming spring. In the end of the official part, Ziyad Raoof update the guests about KRG in Poland plans and initiatives. The main are: campaign for recognition of Anfal Operation as Kurdish genocide by the Polish parliament as well as ISIS crimes against Yezidis as act of genocide, coordination of Polish humanitarian aid in Kurdistan region and many political, economy and cultural events. Also the important representatives of Kurdish community in Poland were invited to the meeting. After the first part guest were invited for lunch, where they could taste many Kurdish dishes. Through this 2 hours meeting Ziyad Raoof and representatives of Kurdish diaspora had many individual conversation with journalists. They answered many questions and in details could present situation in Kurdistan. Meeting with media is a beginning of planned for 2016 media offensive by KRG Poland aimed to make Kurdish voice and KRG stance more heard in Poland. As the result of the meeting, Ziyad Raoof, the KRG Representative in Poland was invited by Eryk Mistewicz to take part in project “Wszystko co najważniejsze”, a platform to exchange opinions and thoughts co-created by more than 400 greatest representatives of politics, diplomacy and media, not only from Poland. The newspaper “Poland Times” published article written by Tomasz Plaskota, presented ongoing situation in Kurdistan Region enriched by Ziyad Raoof’s statements. The article is available here (only in Polish). We invite you also to see photos from the meeting a tour gallery, here.